Gosh, my baby has lived almost a whole year . 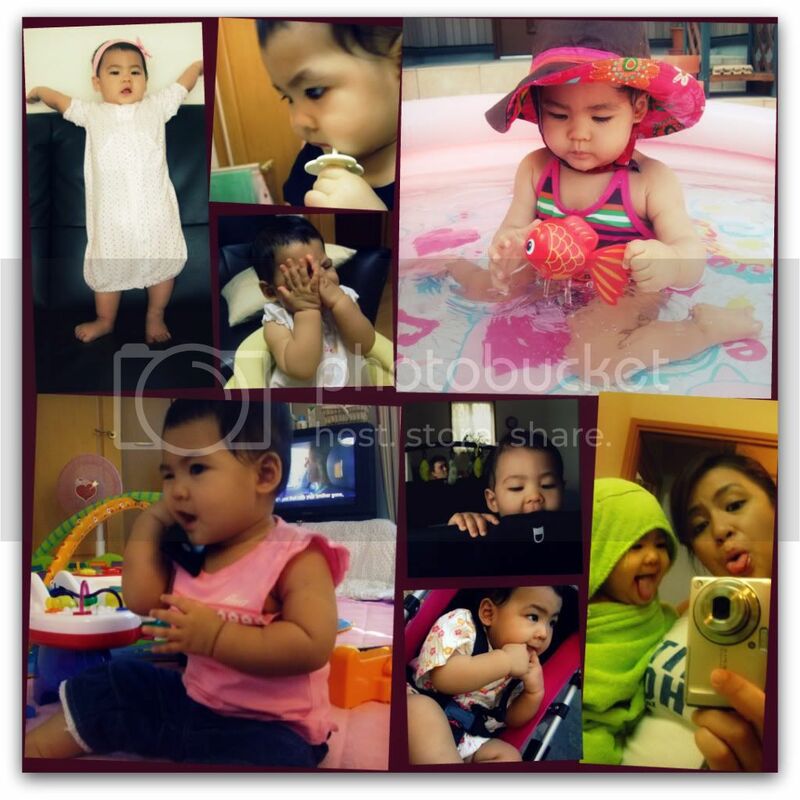 One more month to go before we graduate her from being a baby and enroll in the world of Todlerhood huhuhu ... I feel a smallest bit of denial. Lookie how much she looks like more of kid nowadays, as I distracted her to snap a little bow of her whimsy hair . Her Dad didn't like it although he find her pretty with those horns. He's also in denial lol. 11 months of wonderful life with Baby Anzu . I'm starting to get sentimental about letting her explore more on her own. We may be lucky coz eversince she doesn't want to be always held. She loves the floor more and keeps on moving around the house as she already figured out how to lift that tummy off the ground when crawling. Too mobile that I feel like we're chasing her all the time . There were so many "firstS" and milestones last month that I had hard time keeping some of them up online. --first real words "papa" "hello" "hi", waving "hi" and "Bye", first pool experience, first matsuri, standing, --- there's basically something new everyday . Wasn't it just only yesterday when we were a bit scared of putting her delicate body on a bath for the first time? I was really nervous that I might slipped her out on my slippery hand so Honey took the charge of bathing her, and I was just a helper for months then. One year is just around the corner . If only I could stop my baby from growing I would, but honestly, I'm enjoying every minute of it. It's just that time runs really fast (can't just Mr. Time have a slow walk instead??? lol corny) . You're doing just fine baby... we'll always be here to help you figure out how would you fit in to this world. Love you! HAPPY 11 months old! yeah mommy bamz,i feel the same way too. naks! lol nakaka lungkot minsan na nakikita mong nalaki na ang bebe natin tapos unti unti sasabihin sa atin na ma kaya ko na ang sarili ko.sabi ko nga rin kay hubby kung sana lang hindi na lumaki si yuina,alam mo yun mamimiss mo kapag naiyak siya tayo ang hinahanap?! malapit lapit na rin akong magwork kaya nakakaiyak minsan iisipin mo na kokonti na lang ang oras niyo ni bebe db?! Mom Bamz, I enjoy watching her grow..cute nyang magtooth brush...i'll try it with Hyzyd kasi hanggang ngayon I brushes him with finger brush and he always bites me..LOL! Happy 11 months to baby Anzu. Soon you will be 1 year old and that's a great milestone in your life. Mommy and daddy love you very much but they must learn to let nature take its course and let you unfold as an angelic bundle of joy from God. I know you will grow up to be a God fearing and wonderful child your parents want you to be. Thanks for the post. God bless you all always. They do grow so fast. The next thing you know she'll be in school! :) Cute baby! thanks for your warm message. Makes me feel good. i know exactly how you feel momma bams, ako din i miss my baby thea.. yung super dependent na baby na always clinging in my arms... haaay ngayon she's starting to be independent and have a mind of her own (toddler pa lang yan), how much more kapag schooling starts. Kaya its really important to cherish and take advantage of every minute we spend with them. Nyahahaha I love the pics where the two of you had your tongues out lol... I also love her get up in ht inflatable pool, so kikay! wow! invited ba kami sa grand celebration? Yehey!!! awww laki na nya. ako de ko na-feel yan noon LOL. ngayon lang habang tinitignan ko mga baby pics ni freya de ako makapaniwalang toddler na sya. How time flies so fast... Ang cute naman ng baby mo kahit anong hairstyle... looking more like Mom? Btw, thanks for visiting my new blog. And yes, I am in need of help with WP, super nangangapa ako. I'll appreciate any assistance cause I want my site personalized especially the header. Thanks again and Happy weekend! 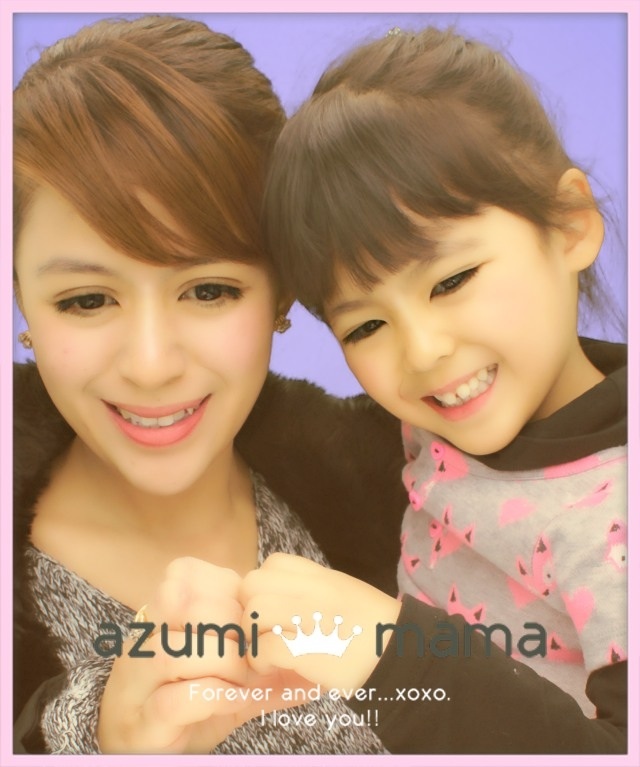 Happy 11 mos Azumi bebe!!!! Ano gusto mo gift for your 1st birthday?? Babies can grow so fast without us knowing, because we are having so much fun watching them and we don't realize how time flies. Wait until she walks and then..it's more fun. She is so adorable..Lucky child for having wonderful set of parents. Take care and Have a wonderful day with your little one.